It has now been five years since the events of the “Arab Spring,” and initial optimism about lasting democratic reforms and an era of lessened tensions has been replaced by fear and skepticism. Many countries are now experiencing greater instability and violence than before. The vestiges of Al Qaeda in Iraq have morphed into the Islamic State of Iraq and al-Sham (or the Levant)—ISIS or ISIL, sweeping through Iraq and Syria and leaving behind much death and destruction. The growth of violent extremism initiated by Al Qaeda and its radical interpretation of the Islamic ideology is continuing. ISIL’s deft manipulation of social media to compel and mobilize individuals to act out violently is both remarkable and frightening. 1. Are the CVE goals achievable? 2. Do we have the right balance between security and development/stabilization? Do we have the right balance between strategies to take violent extremists off the streets and those aimed at preventing extremists from becoming violent in the first place? 3. Do we understand why some strategies have failed to deliver significant reductions in extremist violence? Do we understand the potential unintended consequences of strategies (e.g., use of targeted killings, treatment in prison, etc.)? 4. Are we failing in execution of strategies—by not partnering enough or following when we should lead/leading when we should follow? Have we implemented strategies through smart partnerships—“whole of government” partnerships, partnerships with other countries, partnerships with the private sector, partnering with organizations and communities, etc.? 5. Are we failing to communicate effectively? Do we really seek to understand those with whom we are communicating? Should others be doing the communicating at times? Are our actions consistent with our words? Like most utopian movements, ISIL is riding the winds of change. It will be increasingly difficult for them to recruit new members as the focus shifts from expansion/change to maintenance/status quo. Consequently, the best solution to countering ISIL may be to take an approach that will minimize the potential for unintended outcomes. A “whack a mole” strategy may result in further metastasis of violent extremism. It is imperative to avoid unwittingly serving as the “common enemy” and thus igniting a much larger, sectarian conflict. Queen Rania recently said, “What the extremists want is to divide our world along fault lines of religion and culture…this is about all of us coming together to defend our way of life.” Likewise, keeping the conversation at the “binary,” “right” versus “wrong,” level (e.g., debates regarding interpretation of ideological tenets or terms) will result in an unproductive “he says/he says” conversation. Messaging should be based on a nuanced understanding of the “mythos” rather than “logos” based reasoning. ISIL is, by no means, the only violent extremist organization posing a challenge. It is clear that places where governments are transitioning to or from democracy are dangerous and breed conflict. Further CVE research is needed—research to more fully understand what works and what does not (and why) and research on mobilization and demobilization to more fully understand how ideology is a roadmap to individual behavior and how/why ex-violent extremists disengage. Albert Einstein was quoted as saying, “the problems we face will not be solved by the minds that created them.” Long term commitment to an adaptive CVE approach underpinned by smart partnerships will be required for the foreseeable future. The coordinated, integrated policies/strategies will, over time, create a more desirable outcome—not just an easement of an undesired outcome (extremist violence), but lasting stability and peace, which is the ultimate goal. • the underlying motivations of individuals (whether revenge, status, identity, or thrill seeking) who join violent extremist organizations (Venhaus, 2010). No single solution or solution set generalizes to all groups or locations, necessitating continuous acquisition of information and updating/adaptation of assessments and strategies. 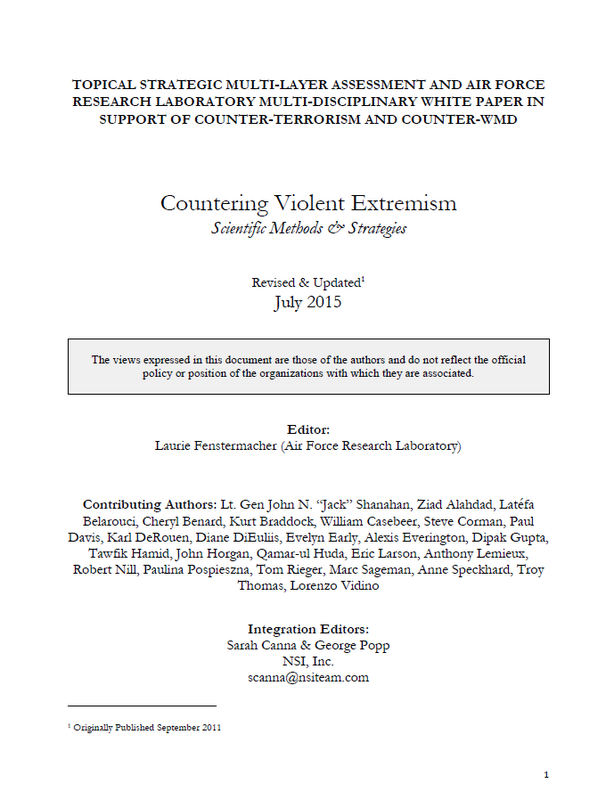 This paper collection, entitled, “Countering Violent Extremism: A Multi-disciplinary Perspective,” aims to provide new insights on the spectrum of solutions for countering violent extremism, drawing from current social science research as well as from expert knowledge on salient topics (e.g., development programs, cultivating community partners and leaders, conflict, and deradicalization). So what is new? There is a large body of literature on terrorism and violent extremism, much of which focuses on developing a better understanding of the problem, including environmental and social/cultural factors and the role of ideology. This paper collection focuses less on root causes and more on solutions for risk management, disengagement (including delegitimization), and prevention of violent extremism. Ultimately, it is hoped that the paper collection can inform a better understanding of, and suggest sets of solutions for, motivating individuals and groups to desist from violence and preventing other individuals and groups from seeking involvement in movements/groups that seek to bring about change through violence. Throughout the collection, there is an undercurrent of “do no harm;” that is, concomitant with suggestions for stopping or preventing violent extremisms, there are cautions on errors to avoid. These cautions implicitly ask the reader to think about things in a different way—in a way that avoids mirroring and simplistic assumptions of what others think or value and widens the timeframe in which we measure success or failure. Many goals related to countering violent extremism, especially disengagement/risk management and prevention require patience and a commitment for the long haul. Patience is required to cultivate the right partners, support the building of institutional capacity and development of leaders, fund appropriate development programs to address local grievances, and support and amplify existing programs that support moderate discourse or develop new programs to deradicalize or disengage individuals from beliefs or attitudes. Likewise, messaging must match actions and must stem from someone who is credible and has a thorough understanding of the key ideological, political, and socio-cultural issues as well as the language, narratives, and symbols. Some of the viewpoints in the collection are surprising and challenge popular conceptions. For example, in some cases, countering violent extremism requires doing nothing; well, not nothing exactly, but rather supporting/amplifying from behind (e.g., supporting social movements seeking governance change) or supporting other leaders, organizations, or states in leading initiatives. A prime example of this is the events of the Arab Spring, which yielded the inherent lesson that, in regions with social injustice and governance grievances, and political opportunity, social movements can and will emerge that motivate change virtually on their own. Another example where a supporting role is often called for is in implementing delegitimization strategies. Delegitimization involves the initiation of a discourse questioning the legitimacy of the violent extremist organization including their performance in other assumed roles/functions (e.g., shadow government, rule of law). This questioning is often best done by others who are more credible, knowledgeable, and steeped in history, ideology, narratives, and culture. The Crown Prosecution Service defines violent extremism as the “demonstration of unacceptable behavior by using any means or medium to express views which foment, justify, or glorify terrorist violence in furtherance of particular beliefs” including those who provoke violence (terrorist or criminal) based on ideological, political, or religious beliefs and foster hatred that leads to violence. Thus, countering violent extremism is something that must address instigators; however, first, countering violent extremism involves understanding and countering the ideas that leverage emotions, narratives, and ideologies that impel violence. Countering violent extremism is not the same thing as countering an ideology. This is not to say that ideology is not important or can be ignored. Current research points to ideology as a framing device or tool to rationalize or impel actions. Some believe that a group ideology is effectively an appliqué on top of an ideology, using the ideology for reinforcement and justification or, said another way, “religion and questions of identity (are) interwoven with questions of resources and political economy” (Vernon, 2011). Success requires decoupling religious and political ideologies and acknowledging and addressing aspects that can foster the behavior changes we ultimately seek.